A look inside Kaitlyn’s finished Playhouse. Kaitlyn’s 4th grade friends were at the Playhouse for the big reveal. Skilled NARI members help to assemble the skylight roof panels in the Playhouse. Framing & roof are done, it’s starting to look pretty cool! Feeling good after finishing the roof. Victoria Johnson of Steven cabinets is a board member of NARI Cares and this fall she facilitated the building of a 12’x12’ “She Shed” for 9-year-old Kaitlyn who is fighting leukemia. 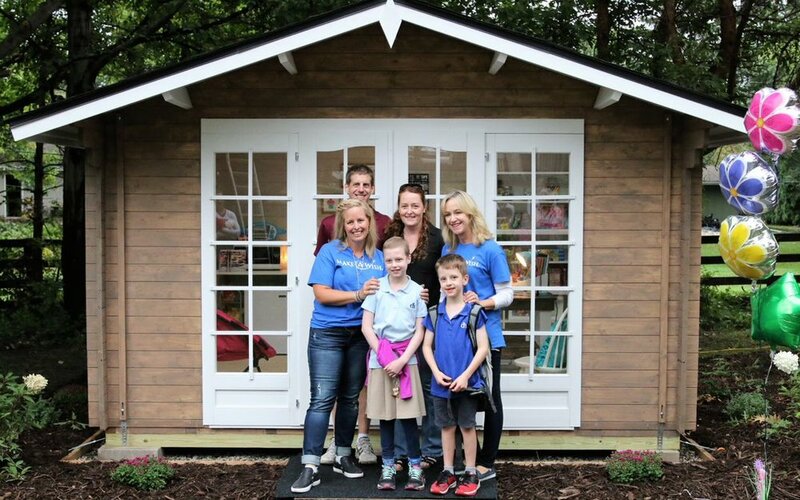 The NARI Cares board was contacted by the Make-a-Wish foundation and asked the skilled NARI members to help build Kaitlyn her own backyard oasis to hang out with friends and create art and crafting projects. NARI (National Association of the Remodeling Industry) Cares is committed to assisting MN homeowners and organizations in need by performing affordable repairs or remodeling projects that will help improve the lives of those less fortunate. Thanks to all of those who participated in helping to build Kaitlyn’s dream: NARI, NARI Cares, The Make-a-Wish foundation, Steven Cabinets, Anchor Roofing & Exteriors, Jack Williams Construction Inc., Hirshfield’s, Che Bella Interiors, BZB Cabins & Outdoors & all of the men and women who came together to make Kaitlyn’s dreams come true. Kaitlyn’s 4th grade class cheers her on as she sees her playhouse for the first time!